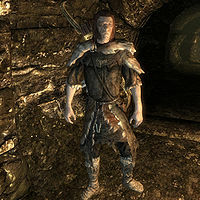 Drahff is a Nord bandit archer who is plotting to overthrow or undermine the Thieves Guild in the entrance to the Ratway. He can be heard scheming with Hewnon Black-Skeever about some indiscernible plot. They will attack you on sight. Drahff wears a set of fur armor and a pair of ragged boots. He is equipped with a leveled bow supplemented with 12 leveled arrows, both of which can be up to Daedric quality. He carries a random leveled gem, and a leveled amount of gold ranging from 25 to 125 gold. Hewnon: "I dunno, Drahff. They'd skin us alive if they knew we were doin' this." Drahff: "Why are you always acting like such a big baby? I've gotten us this far." Hewnon: "This far? We're livin' in a sewer. You said we'd have a house as big as the Black-Briars' by now." Drahff: "You worry about bashing people's heads in, I'll worry about the Guild. Okay?" Drahff: "I'm going to check the entrance to the Ratway. Be right back." I've killed dozens like you. (Persuade): "No need to get hasty. I... I was just testing you. You can go on ahead. Let 'em go, Hewnon. All clear." or "I doubt that very much." How much to let me pass? : "You aren't going to pass. You're going to give me everything you have. Whether you leave here in one piece is up to you." How about I kill you instead? : "Suit yourself. Get 'em Hewnon!" For future encounters, a few friendlier greetings were recorded: "Don't worry, Hewnon will let you pass. ", "We won't give you any more trouble." and "Sorry to have bothered you. I'll just be out of your way now." This page was last modified on 5 February 2017, at 03:56.